Nathan C. Hearn passed away February 14, 2012 at Presbyterian St. Luke’s Medical Center in Denver. He was 38. Born April 10, 1973 in Tillamook, OR to Vern C. and Olivia A. (Reich) Hearn, Nathan spent his youth in Portland, OR. He was active in scouting programs, church youth activities, choir, computers, math, science, and model UN. He participated in chemistry and engineering competitions at the state and national levels, and qualified for an Intel Corp Internship. He graduated from Sunset High School in Portland, OR, received his BS in Physics from Santa Clara University, and his PhD in Theoretical Physics from the University of Illinois. On November 26, 2005, Nathan married Sandra M. Kelly in Nevada City, CA and moved to Longmont from Chicago in 2009. After graduating from college, Nathan did his post doctorate research at Washington State University and the University of Chicago (Flash Group), followed by his employment at NCAR from 2009-2012. Nathan attended St. John the Baptist Catholic Church in Longmont. His many hobbies included singing, photography, computer programming, playing video games, watching dumb movies, rollerblading, and sharing his unique sense of humor. 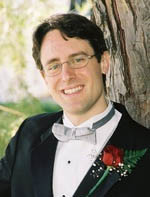 Nathan belonged to a number of church choirs and several professional scientific and programming organizations. Nathan is survived by his wife Sandra Kelly; his father Vern C. Hearn; his mother Olivia A. Hearn; his brother Joel C. Hearn; and his sister Charis A. Hearn. The Funeral Service will be held at 11:00 a.m. Monday February 20, 2012 at St. John the Baptist Catholic Church. Cremation at Ahlberg Funeral Chapel and Crematory will follow the service. Memorial contributions may be made to Be The Match: The National Marrow Donor Program or Catholic Relief Services in c/o Ahlberg Funeral Chapel. Visit ahlbergfuneralchapel.com to share condolences.